Instant Pot Lamb Stew is better than any Irish Stew you have ever eaten. It is bursting with flavor and the meat is super tender. 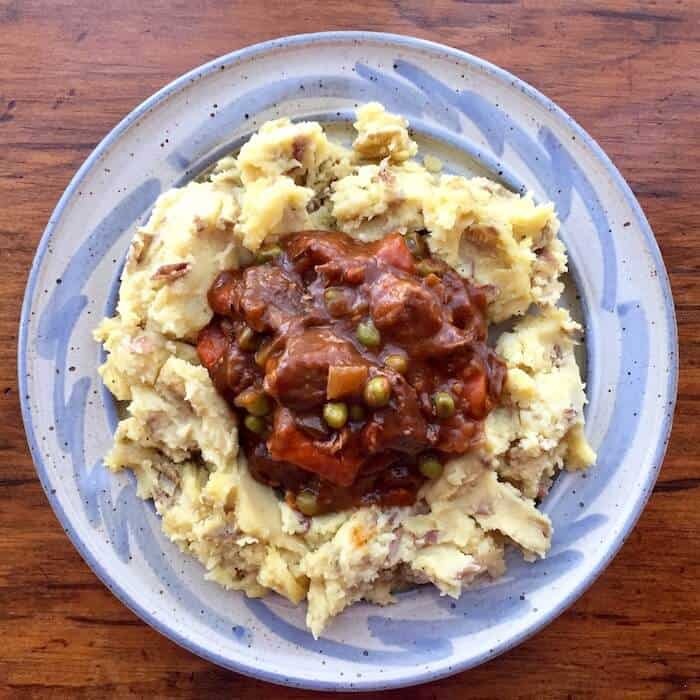 Instant Pot Lamb Stew and Mashed Potatoes, great comfort food. Hi. 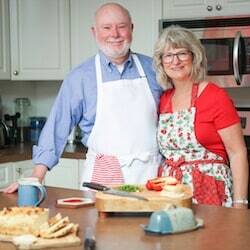 It’s Lois, telling you about the best Instant Pot Lamb Stew I have ever eaten. It is modeled after my Instant Pot Beef Burgundy Bourguignon, but I left out the potatoes and added more garlic and tomato paste. We served it over mashed potatoes to a group of friends, and they ate every last bit of it! When I make food, I generally make enough to have leftovers a couple of times. 8-quart Instant Pot. Buy it on Amazon today. Kitchen Bouquet Browning and Seasoning Sauce. Buy it on Amazon today. 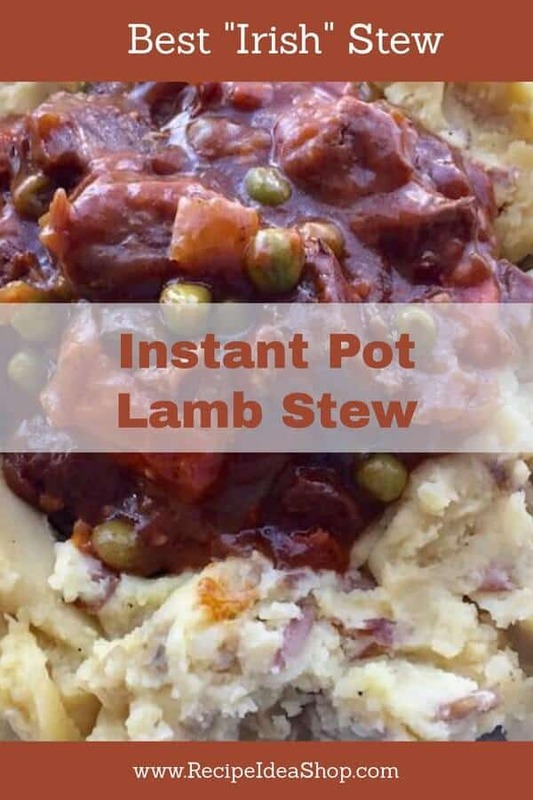 Better than any Irish Stew, this Instant Pot Lamb Stew is the best comfort food, especially served over mashed potatoes. Press the Sauté button on your Instant Pot. When the sensor reads “Hot,” put in the fat from the lamb and sauté until crispy. Remove the lamb pieces before continuing because they will get tough. Now sauté the bacon pieces until crispy, stirring periodically. Remove the bacon to a small dish. It will be added again later. While the bacon is cooking, mix 2 tablespoons of gluten free flour with the salt and pepper. Then toss the lean lamb cubes in this mixture until well coated. Add the floured lamb to the pot and sauté in small batches until nicely browned on all sides. Remove the lamb and set aside for a bit. Deglaze the pot with the brandy. This means pour the brandy in and using a wooden spoon, scrape and loosen all the little brown pieces of meat and goodies that are in the bottom of the pan. This is an important step because if you don't get all the browned bits from the bottom of the pot, they will burn when you are cooking the stew. Add the onion and carrots, and sauté them until starting to caramelize. Return the meat to the pot. Add the celery, potatoes, mushrooms, and garlic. Open the lid and remove the thyme/bay leaf bundle. Set the pot to “sauté” and add the pearl onions, peas and the slurry sauce. Continue to cook, stirring frequently, until the gravy thickens (about 5 minutes). Add the thawed pearl onions and peas. Continue cooking for about 5 minutes. Serve immediately over mashed potatoes in soup bowls. This recipe was inspired by Sue Moran and her Beef Bourguignon recipe on https://theviewfromgreatisland.com. 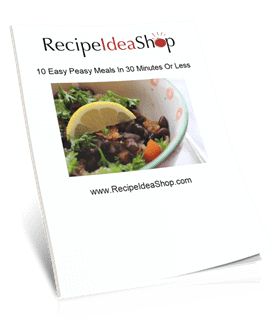 Instant Pot Lamb Stew Nutrition Label. 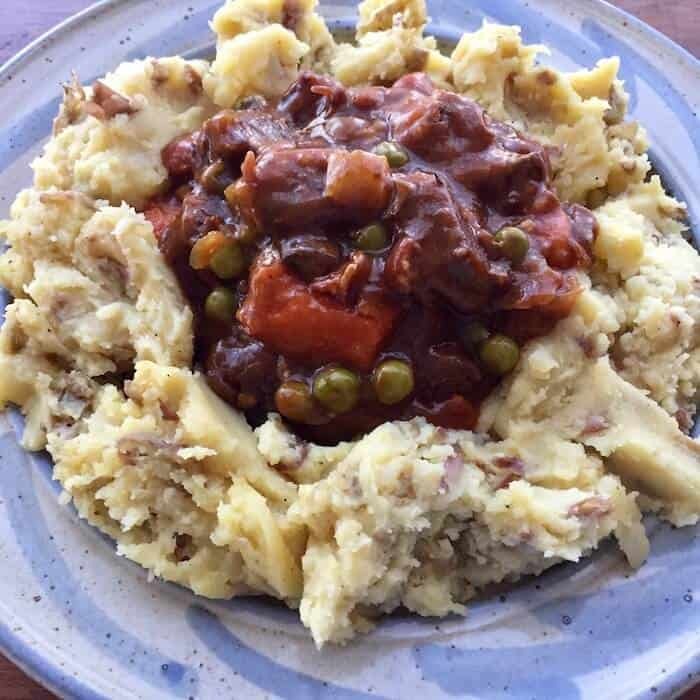 Each serving is about 1 cup of stew. Nutrition Label does not include mashed potatoes, which add about 307 calories per 3/4 cup.